Out in Lancaster County there are many, many buggies on the road.. 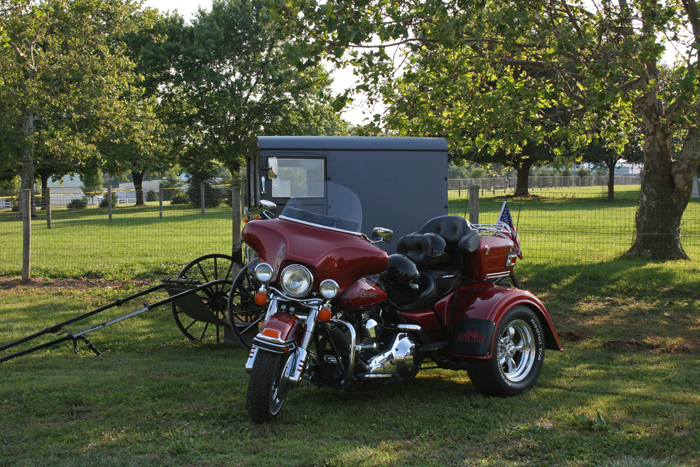 It is the mode of transportation for the Amish. My good friends are Old Order Amish. This is like being the most Amish you can be. My friends are a two buggy family as their oldest son is seventeen and has a horse and buggy of his own, not unlike my own children getting a car at 16. Well, actually, it is not at all like getting a car, but you get the idea. We all give our teenagers the opportunity to get away from us because we all need to keep our sanity. A new buggy costs about $4000.00, which is considerably less than a new car. In many ways, it is just like a car, it has seats, brakes lights and windshield wipers so it is just like a car except that it has no engine. A small but important piece. Instead, you have to add the horse and all that hay and feed. Then of course, after the hay goes in you have to deal with the hay going out. Being the good Faux Farm Girl that I am pulling up to that gas station is a whole lot easier. Even at $3.30 a gallon. Even in my gas guzzling Denali. Another mode of transportation for the Amish, aside from just plain walking, is the scooter. Men and children alike ride these things all around. They are actually very stable and get you where you need to go. Since the horse and buggy was totally out of the question for all the above reasons, I bought a scooter for Jilly. You know, just to get the faux farm thing going. And yes, I have ridden it my driveway and no, I have not taken to the store to get groceries. Old Order Amish do not use bicycles for reasons I cannot explain since the scooter works on a similar principle except for the sitting down part and the chain. 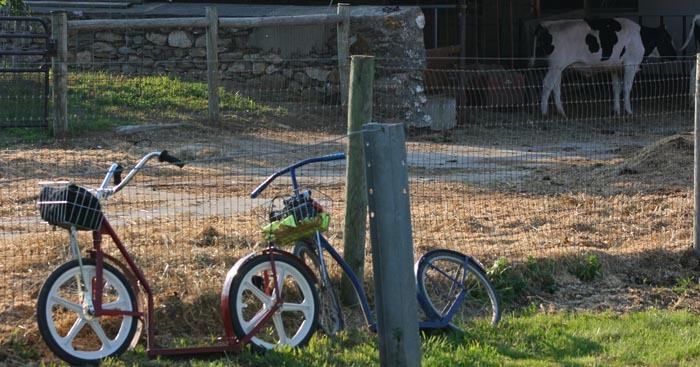 Mennonites and the more moderate Amish do use bicycles, just in case you wanted to know. 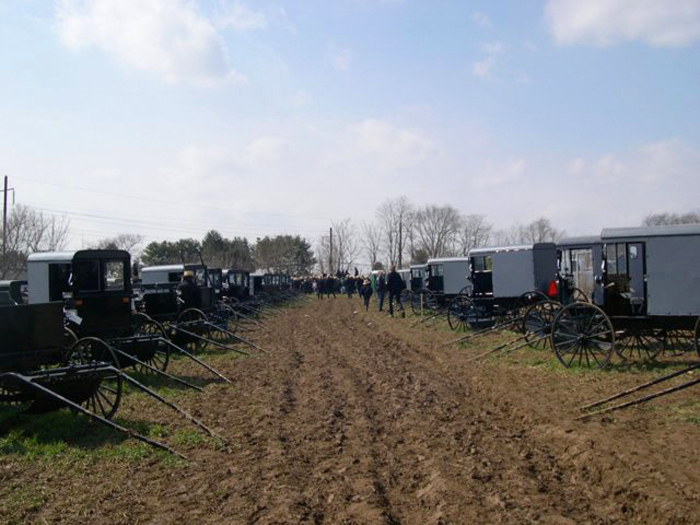 As for walking, the Amish are big walkers. The women and children only wear black shoes, or sneakers. If you ever go into an Amish shoe store, you will be truly amazed at how many black shoe styles exist. Men wear black shoes for dress however, they wear all kinds of work shoes around the farm or shop. Once the weather is nice the girls and women love to go barefoot around the farm. That sounds kind of nice! One summer I watched Nancy and Annie Sue just casually walk across the gravel driveway into the barn. I thought, gee why doesn’t that hurt their feet, do they have special smooth stones? So I took my shoes off and followed them, ouch, ouch, ouch, ouch with each step and five more ouches back to my shoes. Oh dear lord – I need a pedicure and some paraffin wax treatment for my feet. They do not have special stones, they have special feet! Who Knew! 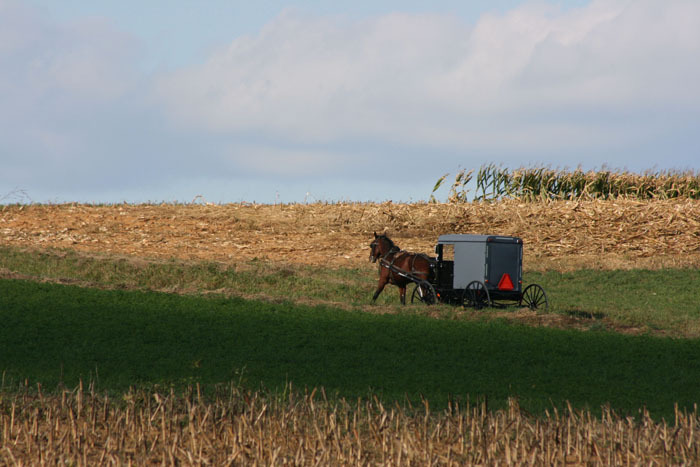 Now since you are not Amish and you are allowed to ride a bike let me tell you, the countryside in Lancaster County is perfect for bicycling. The roads aren’t too hilly, the scenery is spectacular, and the people are friendly. Sundays are a great day for getting out and about, as the traffic is minimal since most businesses and restaurants are closed on Sundays. If you ever get out that way check out www.padutchcountry.com for maps. There are over 25 covered bridges in the country! You can drive too if you are lazy like me – I have never attempted to bike around the county. And I never will! Of course, motorcycles are also popular on the roads so keep your eyes out for them.